We have often written that one of the primary joys of running a netlabel is discovering music and artists that we have not heard before, particularly when the music is staggeringly good. This is one of those instances, folks, as we welcome Daniel Davis of Carl Sagan's Ghost to the roster of Earth Mantra artists. And staggeringly good is right. Daniel's newest album, entitled Darkness and the Light, is by any measure a world-class ambient album, one we think is destined to become a true classic. 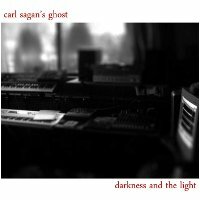 According to Daniel, Darkness and the Light is the third in a series of six ambient albums he has been recording in 2009 (the previous two being Music for Home Offices: Volume 1, and Behind Clouds). "I like the title because it lacks the word 'The' before 'Darkness', adding a poetic nuance to the phrase. Without the article 'the', the Darkness is indefinite, more vague and nebulous. It's not The Darkness, it's just darkness. But The Light is different; it's a definitive, and singular thing, something to move towards. I think the title reflects the album's concept. "Yes, this is a concept albums. But aren't most ambient releases? It's my attempt at putting to music a journey from the realms of darkness into the realms of light and the stuff in between. At least this is what it means to me. Music has always been an intensely spiritual thing for me. But music needs to do more than edify the soul; it also needs to charge the mind, and move the body. I hope I've accomplished all of these aspects with this album." Daniel originally intended Darkness and the Light primarily for album-length listening, to be heard completely from beginning to end, in a single setting, in order to be fully appreciated. It is comprised of two trilogies and a two-part interlude, each composition meant to be heard in context with the others. However, we can tell you that the individual pieces in this album stand very strongly on their own, and while it is indeed a profoundly moving experience to hear the album in its entirety, each piece is exceptional no matter how you listen to it. For this is one of those albums that can only be called a masterpiece. Indeed, when Daniel first asked us if we might be interested in releasing his album, our response was that not only were we interested, but we would be heartbroken if we couldn't. This album really is that good. Darkness and the Light is an elegantly designed and brilliantly executed ambient album that stands tall with the best ambient music we have ever heard, by anyone anywhere. It is mature, it is thoughtful, it is subtle, it is immaculate, it is beautiful, and it is a must-have for anyone who loves any form of ambient music. One of the best releases of 2009, and one we think people will be listening to for a very long time to come. After listening to ambient music for many years, I've come to realize that, oftentimes, the artists and releases that become my favorites are those that not only create great "music" but that create unique and engaging electronic sounds. Artists like ISHQ and Global Communication are great examples. And who can forget Vangelis's powerful synth sounds in the Blade Runner soundtrack. This release HAS those two ingredients in bucketfuls: great ambience AND a wonderful electronic palette of sounds. Superb! I am playing this at work today and decided I need to add my two cents on just how good this album is. My favorite Earth Mantra release, I come back to it often. Nothing fancy, just cool, minimal, floating ambience. Love it! My music listening habits most often follow seasons. I listen to experimental electronica throughout summer and spring, while autumn and winter are always a time for krautrock, classical music and ambient. For some reason, ambient sensibilities are just the most fulfilling in winter. "Darkness And The Light" is one such release, which is an even more pleasurable experience with real snow and real darkness visible through the window. Ambient at its best. Dynamic floating textures and chords. Perfect music for a quiet evening. The Perfect Balance. Daniel Davis has created here what can truly be termed an ambient masterwork, striking the perfect balance between ambience & interestingness, mysterious abstraction & poetic beauty, vast spaciousness & warm intimacy, darkness & the light. An instant classic worthy of repeated listening & permanent residence in any ambient music collection.